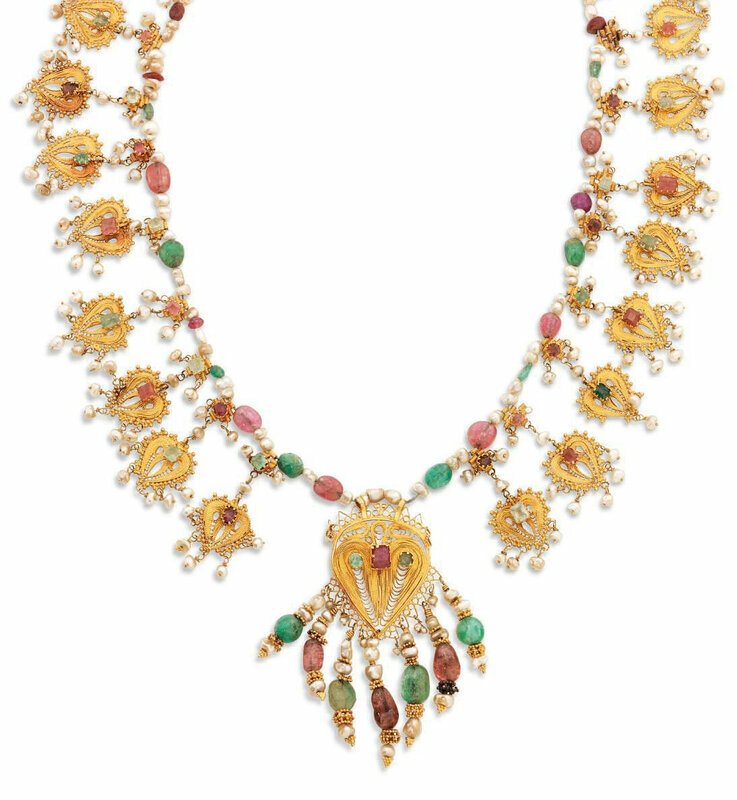 In the form of a ruby and emerald-set peacock, the border fitted with baroque pearls, the chain with stones alternating with pearls. Note: Peacocks are considered sacred in India. Often associated with the Indian goddess Lakshmi, the peacock is also the animal mount of Kartikeya, the Hindu god of war. Krishna is also generally depicted adorned with peacock feathers over his head. The back of the pendant is engraved but unadorned suggesting a Deccani origin as the backs of North Indian jewellery items are usually enamelled. For a 19th century bracelet in the Nasser D. Khalili collection, possibly from the Deccan, with comparable gem-setting and the reverse undecorated, see P. M. Carvalho, Gems and Jewels of Mughal India, Volume XVIII, The Nasser D. Khalili Collection of Islamic Art, London, 2010, no. 95, p. 184. 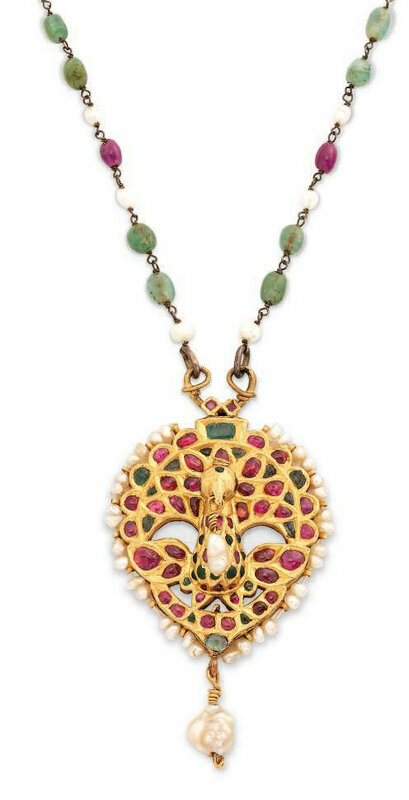 Comparisons can also be drawn with a small group of Deccani bird-shaped gem-set pendants, dating from the 17th and 18th centuries, the birds depicted with open wings and fanned tails, a pearl sometimes suspended from their beaks like our pendant. 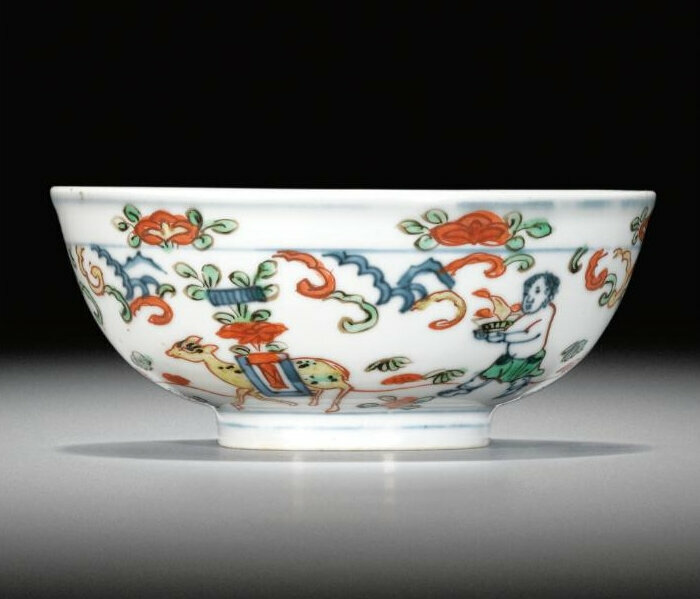 There is one in the Al-Sabah Collection in Kuwait (M. Keene, Treasury of the World, London, 2001, cat.no.8.38, p.108); another in the Musée Guimet in Paris (inv. no. M A 6768, A. Okada, Imperial Mughal Painters, Paris, 1992, p.147); and two from the Nasser D. Khalili collection discussed in Carvalho, op. cit., no. 20, 21, pp. 76-77.